Fenton – a young gentleman. Anne Page – Mistress Page's daughter, in love with Fenton. The play's date of composition is unknown; it was registered for publication in 1602, but was probably several years old by that date. In the Fairy pageant in Act 5 Scene 5 (lines 54-75), Mistress Quickly, as the Queen of the Fairies, gives a long speech giving an elaborate description of the Order of the Garter. The play also alludes to a German duke, who is generally thought to be Frederick I, Duke of Württemberg, who had visited England in 1592 and was elected to the Order of the Garter in 1597 (but was eventually only installed in Stuttgart on 6 November 1603). These facts led commentators starting with Edmond Malone in 1790 to suggest that the play was written and performed for the Order of the Garter festival. William Green suggests that the play was drawn up when George Carey, as Lord Chamberlain and patron of Shakespeare's company, was elected Order of the Garter in April 1597. If this is so, it was probably performed when Elizabeth I attended Garter Feast on 23 April. The Garter theory is only speculation, but it is consistent with a story first recorded by John Dennis in 1702 and Nicholas Rowe in 1709: that Shakespeare was commanded to write the play by Queen Elizabeth, who wanted to see Falstaff in love. This theatrical tradition was first recorded by Dennis in the prologue to his adaptation of the play, The Comical Gallant. He states that Queen Elizabeth "commanded it to be finished in fourteen days." Rowe wrote that Elizabeth "was so well pleased with that admirable character of Falstaff, in the two parts of Henry the Fourth, that she commanded him to continue it for one play more, and to shew him in love." T.W. Craik suggests that these stories may simply be fantasies occasioned by the Quarto's title page which says of the play "As it hath diuers times Acted...Both before her Maiestie, and else-where." Nevertheless, Carey would have been well placed to pass on the queen's wishes to his players, which could account for the tradition. Support for the Garter theory is divided. If it is correct, it would probably mean that Shakespeare wrote The Merry Wives of Windsor between Henry IV, Part 1 and Part 2. Critics have trouble believing this for several reasons. One is that Pistol and Shallow are introduced as new characters in Henry IV, Part 2, but in The Merry Wives their connection to Falstaff is taken for granted. Also, there are no references to any of the major events from Falstaff's 15th-century exploits from the history plays, such as the rebellion (Henry IV, Part 1 & 2), in Merry Wives. T.W. Craik suggests that Shakespeare was forced to interrupt work on Henry IV, Part 2, having written most of it, because The Merry Wives had to be completed quickly. Another possible explanation comes from the epilogue to Henry IV, Part 2, which promises to "continue the story, with Sir John in it". Sir John does not appear in Henry V, so Merry Wives could have been written to make good on the pledge. At least parts of the play may have been written around or before the first performances of Part 1 in 1597, after which controversy over the original naming of Falstaff (he was originally the historic Sir John Oldcastle, which presumably did not please Oldcastle's descendants) forced Shakespeare to rename the character. It appears that the joke in V,v,85–90 is that Oldcastle/Falstaff incriminates himself by calling out the first letter of his name, "O, O, O!," when his fingertips are singed with candles—which of course works for "Oldcastle" but not "Falstaff." There is also the "castle" reference in IV,v,6. 18 January 1602 was the date the play was entered into the Register of the Stationers Company. The first quarto was published later that year, in an inferior text, by bookseller Arthur Johnson. It was published in a second quarto in 1619, as part of William Jaggard's False Folio; the superior First Folio text followed in 1623. The title page of Q1 states that the play was acted by the Lord Chamberlain's Men, "Both before Her Majesty, and elsewhere." The earliest definitely dated performance occurred on 4 November 1604, at Whitehall Palace. The play is also known to have been performed on 15 November 1638, at the Cockpit in Court. A 1902 illustration done for Herbert Beerbohm Tree's coronation revival, featuring Ellen Terry as Mistress Page, Margaret Kendal as Mistress Ford, and Tree himself as Falstaff. 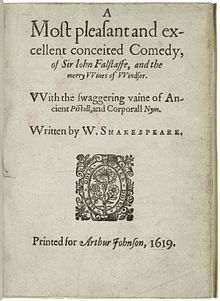 Most critics consider Merry Wives to be one of Shakespeare's weakest plays, and the Falstaff of Merry Wives to be much inferior to the Falstaff of the two Henry IV plays. That Shakespeare would so stumble with one of his greatest creations is puzzling and a satisfactory reason for this remains to be found. The most obvious explanation is that it was written very quickly. Leslie Hotson wrote that "it is certain that the play bears the earmarks of hasty writing." The play is centred on the class prejudices of middle-class England. The lower class is represented by characters such as Bardolph, Nym, and Pistol (Falstaff's followers), and the upper class is represented by Sir John Falstaff and Master Fenton. Shakespeare uses both Latin and misused English to represent the attitudes and differences of the people of this era. For example, much humor is derived from the exaggerated accents of Dr. Caius and Sir Hugh Evans. For example, Caius speaks in an exaggerated French dialect ; when he finds out he has married a page instead of Mistress Anne he exclaims that he has married "oon garcon", and Evans speaks in a thick Welsh accent to the point that Falstaff complains that he "makes fritters of English" (5,5,135) Much of the comedic effect of the play is derived from misunderstandings between characters. Other scholars say that the treatment of sexual jealousy in the play differs from its treatment in others, like Othello and A Winter's Tale. The jealousy of Leontes and Othello is dangerous and deep-seated, while Ford's jealousy is something to be mocked and laughed at. A scene from the original production of Verdi's Falstaff (1893) as depicted by artist Ettore Tito. Merry Wives was one of the first Shakespearean plays to be performed once the theatres re-opened in 1660 after the Interregnum. Samuel Pepys saw the King's Company act it on 5 Dec. 1660, and again in 1661 and 1667 (though he didn't like it on any occasion). In 1702 John Dennis offered an adaptation (it has been called a "perversion") of the play, titled The Comical Gallant, or the Amours of Sir John Falstaff – which flopped. In 1824 Frederick Reynolds included Merry Wives in his series of operatic adaptations, with music by Henry Bishop. Charles Kean returned to Shakespeare's text in an 1851 production. Arthur Sullivan composed incidental music for use in Act V of an 1874 production at the Gaiety Theatre, London, which was also used in the 1889 Haymarket Theatre production. Mistress Page (Julie Hughett) and Falstaff (John Rousseau) in The Merry Wives of Windsor, staged by Pacific Repertory Theatre at the Golden Bough Playhouse in Carmel, California, in 1999. The composer Antonio Salieri wrote the opera buffa Falstaff (1799), with a libretto by Carlo Prospero Defranceschi, which also adapts the main story line of The Merry Wives of Windsor for the operatic stage. Michael William Balfe's opera, Falstaff (1838), to a libretto in Italian by Manfredo Maggioni, is based on the play. The German composer Carl Otto Nicolai wrote a "singspiel" based on the comedy in 1849, Die lustigen Weiber von Windsor. The opera contains much German spoken dialogue, and many of the characters' names have been changed (the names of the Mistresses Ford and Page are now Fluth and Reich) and there is more focus given between the romance of Fenton and Anne. It is the only adaptation to include the disguising of Falstaff as a woman. Giuseppe Verdi's last opera, Falstaff, with a libretto by Arrigo Boito, is based on the play. In this adaptation, the plot is kept largely as Shakespeare wrote it, but the story line is condensed and simplified, and there are several changes. For example, Anne (known as Nanetta) is now the daughter of Mistress Ford, not Mistress Page, and she is betrothed by her father to Dr. Caius alone, with Mistresses Ford and Page conspiring to aid in her elopement with Fenton. The roles of Master Page, Slender, Shallow, Sir Hugh Evans, and many others are eliminated. To flesh out Falstaff's character, librettist Arrigo Boito adds material from Shakespeare's Henry IV, Parts I and II, including the famous "honor" soliloquy found in act I scene II of Henry IV Part I. It is largely considered to be the best operatic adaptation of The Merry Wives of Windsor, as well as one of opera's greatest comic achievements. The English composer Ralph Vaughan Williams wrote Sir John in Love, an opera based on this play in the years 1924–28. Much of the libretto is taken directly from Shakespeare's text, making it the most accurate of the operatic adaptations. The only version to retain all of the characters as well as the subplot of the duel between Dr. Caius and Sir Hugh Evans. The play was adapted to Kiswahili by Joshua Ogutu and performed at the Globe Theatre in London as part of the 2012 Globe to Globe festival. For the 2012 Oregon Shakespeare Festival season, Alison Carey adapted the play into a political satire called The Very Merry Wives of Windsor, Iowa. For the 2012 Bard on the Beach season in Vancouver, Director Johnna Wright set the play in 1968 Windsor, Ontario. An episode of American TV drama, Criminal Minds, uses a production of The Merry Wives of Windsor as a motif. ^ Van Santvoord, George, editor, The Merry Wives of Windsor (New Haven: Yale University Press, 1922): 119. ^ a b Duncan-Jones, Katherine (2001). Ungentle Shakespeare: scenes from his life. London: Arden Shakespeare. pp. 97–8. ISBN 1-903436-26-5. ^ Green, William (1962). Shakespeare's 'Merry Wives of Windsor'. Princeton. pp. 58–59. ^ Bate, Jonathan; Rasmussen, Eric (2011). The Merry Wives of Windsor. Basingstoke, England: Macmillan. pp. 5–6. ISBN 978-0-230-28411-1. ^ Leslie Hotson, Shakespeare Versus Shallow, Little, Brown, and Company,1931, p.112. ^ F. E. Halliday, A Shakespeare Companion 1564–1964, Baltimore, Penguin, 1964; p. 314. ^ Geoffrey Dennis, Coronation Commentary, Dodd, Mead and Company, New York, 1937, p.40. Wikimedia Commons has media related to The Merry Wives of Windsor. This article is about Shakespeare's play. For other uses, see The Merry Wives of Windsor (disambiguation). This page was last edited on 16 April 2019, at 02:35 (UTC).